Eilean Donan Castle, ubiquitous star of movies, calendars, biscuit tins and tea-towels, is pretty much a 20th-century creation. Rescued from almost total ruin, it says something for its rebuild, and the success of Scottish tourism, that it is not only one of the most photographed and visited castles in Scotland, but also one of the most recognised fortresses in the world. Indeed, thousands of tourists flock to it every year from across the globe, many of them transported by the coach-load and armed with a tour operator’s tartanry itinerary that includes every conceivable Scottish tourist attraction (with a complimentary wee dram at bedtime). Some visitors stop long enough to snap photographs from the loch side; others are efficiently processed through the neat, modern, visitor centre from which they coo their way across the bridge to get up close and personal with a real Highland fortress – except that it isn’t. No one can deny that Eilean Donan Castle is almost preposterously picturesque and ridiculously romantic. Whilst eschewing the gushing hyperbole of some of the more vacuous tourist articles you will come across, the location – perched on a small island seemingly floating magically on the water where Lochs Duich, Long and Alsh meet, is stunning; a vision of perfection just off the A87 road to the Kyle of Lochalsh and the Isle of Skye. If you ran a tourist attraction or wedding venue, it couldn’t get much better than that, could it? For almost two centuries, until purchased by Major John Macrae-Gilstrap in 1911, Eilean Donan Castle had been a steadily decaying roofless ruin. Macrae-Gilstrap was a career British Army officer whose paternal great-great grandfather had died for the Jacobite cause at the Battle of Sherrifmuir in 1715. 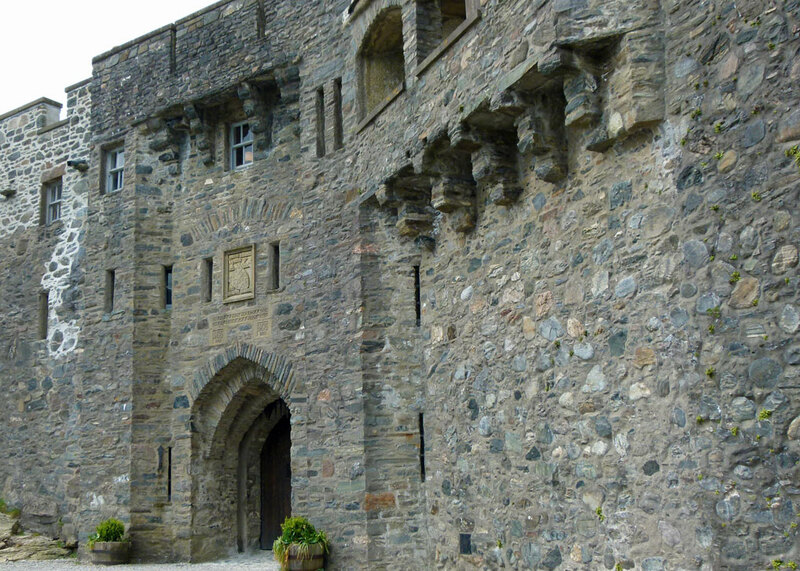 With the help of his wife’s money, architect George Mackie Watson and local stonemason Farquar Macrae – who apparently had a significant dream in which the castle appeared to him, restored exactly as it should be – Macrae-Gilstrap was able to reconstruct the castle based on the surviving ground plan. Work began in earnest after the First World War (by which time Macrae-Gilstrap was a Lieutenant-Colonel) and, including a footbridge to connect with the mainland, was formally completed in 1932. 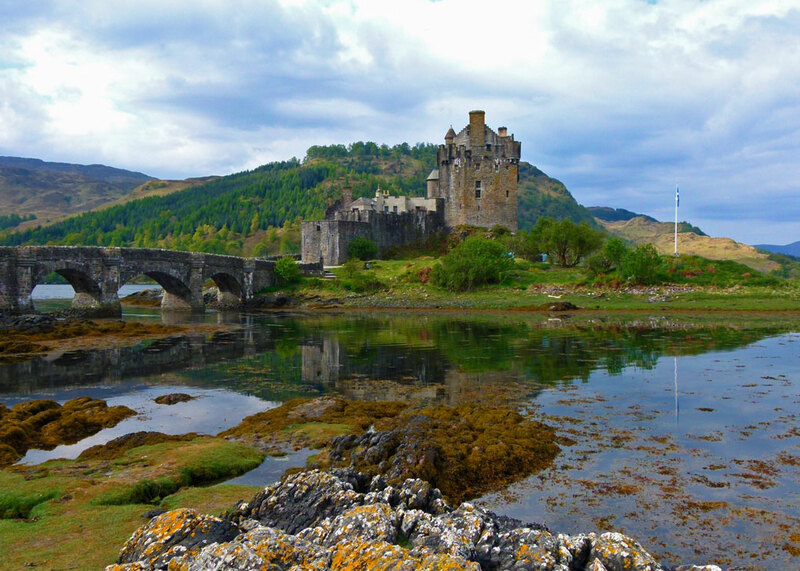 Eilean is a Gaelic word for ‘island’ – it can also mean a piece of raised ground – and it is generally thought that Eilean Donan means Donan’s Island. 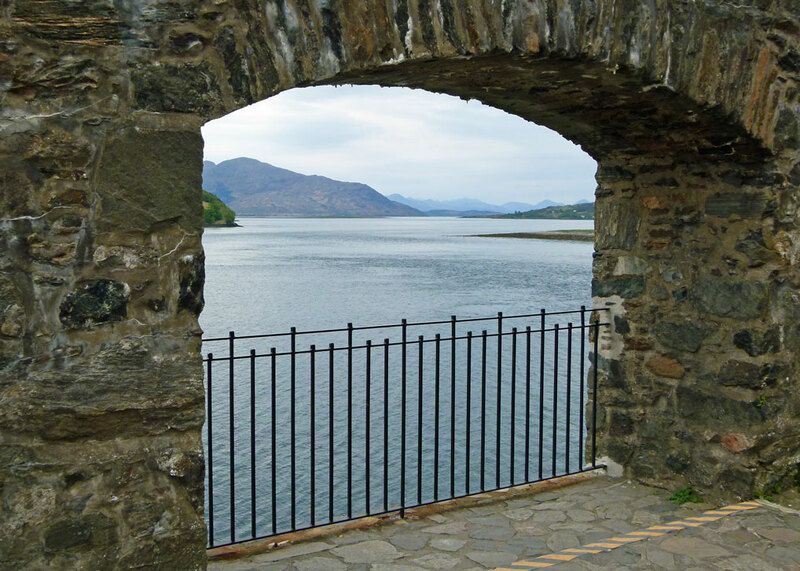 Donan was a 7th century saint who is said to have had a cell, or chapel, on the island. A contemporary of St Columba, Donan achieved everlasting fame as abbot of a monastery on the Isle of Eigg, which was attacked by bandits on 17th April 617. The story goes that Donan was celebrating mass when the raiders burst in, but the thugs were obviously a decent, patient, bunch, because they allowed Abbot Donan to finish before beheading him, and his 52 monks. Another version is that the hapless clerics were locked in the refectory, which was then put to the torch. Either way, it is a typically barbaric tale. I prefer the less likely myth that the island was once home to the King of the Otters, that the castle was built on the spot where he died and the name is derived from cu-donn, which is Gaelic for otter. 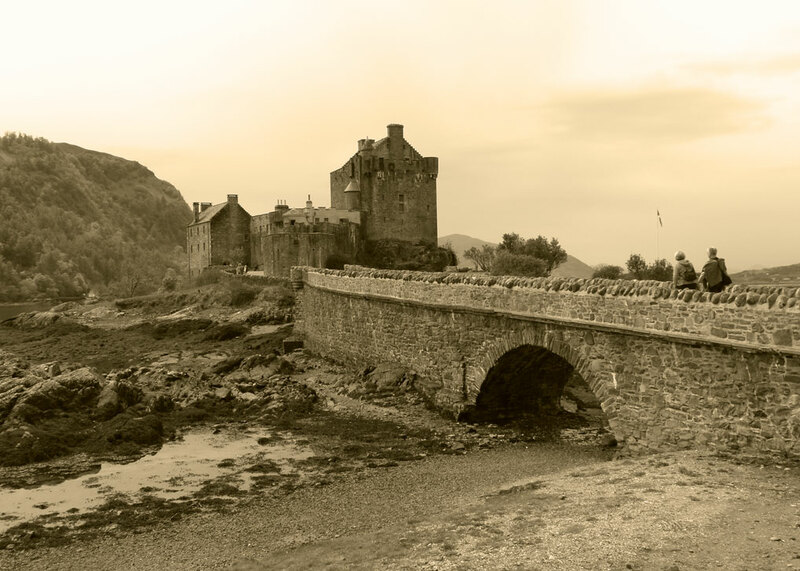 Much of the history of Eilean Donan is wreathed in the mists of elusive legend and the often bloody fog of tribal power-struggles between the Kings of the Scots, the Norse-Gaelic Kings of the Isles, their successors, and common, or garden, inter-clan rivalry. One legend tells that the founder of Eilean Donan Castle was of the Clan Matheson, a son of a chieftain, who could converse with birds. Another story tells of the king’s representative decapitating 50 local lawless miscreants and displaying their heads from the castle walls as a lesson to others. One thing’s for sure, Eilean Donan was in an excellent strategic location. There was possibly an Iron Age fort on it, but the first definite construction identified to date is a curtain wall that almost encircled the entire island in the early 13th century, with a keep on the highest point. This fortification was probably intended as a defence against the Nordic King of the Isles. After the Battle of Largs in 1263 between King Haakon IV of Norway and Alexander III, King of Scots, Norse power declined in the area and the vacuum was eagerly filled by Clan Donald, whose chief became Lord of the Isles. Alexander III, meanwhile, gave Eilean Donan to the Mackenzies. 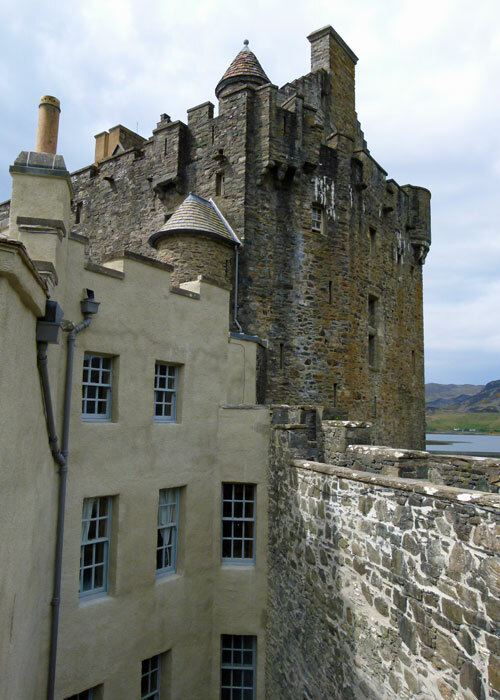 There’s a Mackenzie tradition that Robert the Bruce was given shelter in Eilean Donan Castle at a time when he was simultaneously unpopular with many clans and being pursued by the English. The Mackenzies were later allied with the Maclennans and the Macraes; the latter would in time act as bodyguards to the Mackenzies and become known as the Mackenzies’ shirt of mail. Sometime around the late 14th/early 15th century, the castle was reduced in size – why is not clear. Then, about 100 yeas later, a hornwork – a separate bastion – was added to provide a firing platform for cannon. 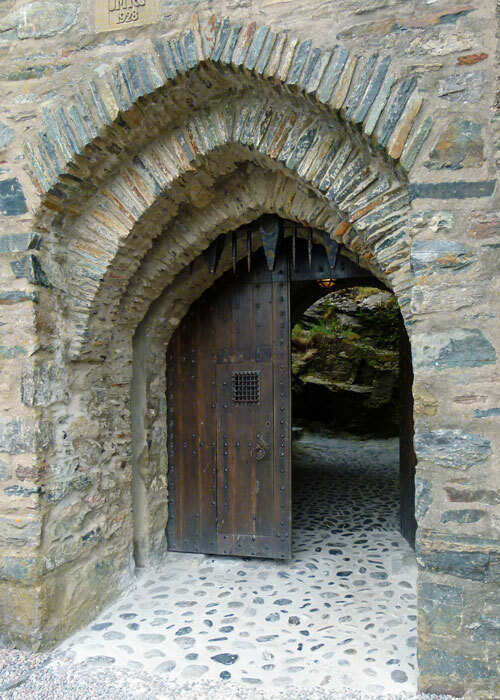 In 1511, the MacRaes became constables of Eilean Donan. However, the event for which Eilean Donan Castle is probably best known is the part it played in the Little Rising, the often-forgotten hardly-begun Jacobite rebellion of 1719. Britain was at war with Spain and the Spanish proposed to make trouble by assisting the Jacobite cause. A two-pronged attack was planned: a main force would land in south west England and march on London, where it would miraculously depose King George I; meanwhile, a separate force in the Highlands would provide a diversion. The main fleet was, unfortunately or fortunately for the rebels, scattered by storms and had to return to port. But a smaller fleet, which included 307 Spanish soldiers and a good quantity of arms and ammunition, successfully arrived in Loch Alsh and occupied Eilean Donan Castle. Alas, the Highland clans did not flock to join the cause; support was decidedly lukewarm. Meanwhile, the Royal Navy dispatched five ships to the west coast of Scotland, to see what was going on. 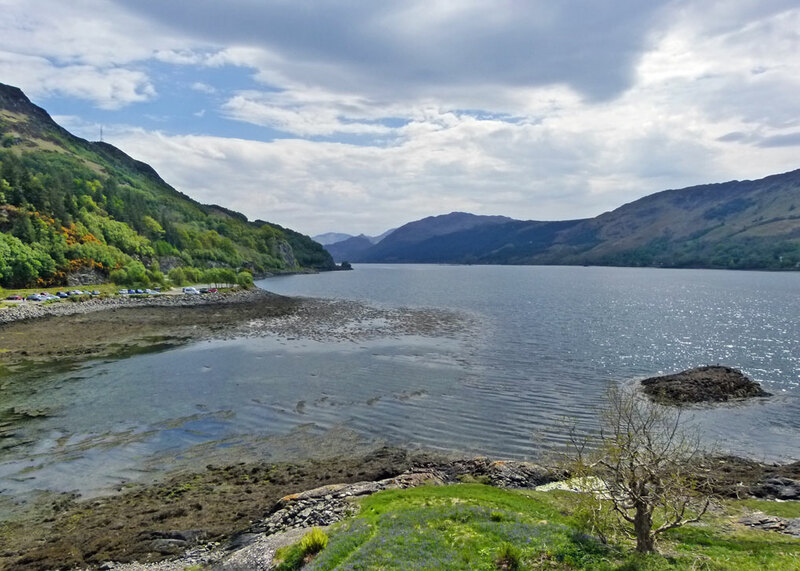 While two patrolled off the Isle of Skye, three – HMS Worcester, HMS Flamborough and HMS Enterprise – slipped into Loch Alsh and, on the morning of Sunday 10th May 1719, they anchored off Eilean Donan. Acting on intelligence from a deserter, a boat was sent ashore, but was fired upon. The boat was, accordingly, recalled, and all three ships turned their guns on the castle. The bombardment continued the following day when a landing party easily overcame the defenders. Accounts vary (as usual), but the castle apparently contained 40-odd Spanish soldiers, an Irishman, one Scottish rebel, 343 barrels of gunpowder and other munitions. After securing their prisoners, the Royal Navy used some of the gunpowder to blow what remained of the castle after the bombardment to smithereens. The other Spaniards had left the castle before the Navy arrived and, on 10th June, were defeated alongside about 800 Highland allies 12 miles away at the Battle of Glen Shiel. The Spanish survivors, including those from Eilean Donan, were eventually repatriated. The Highlanders melted away. 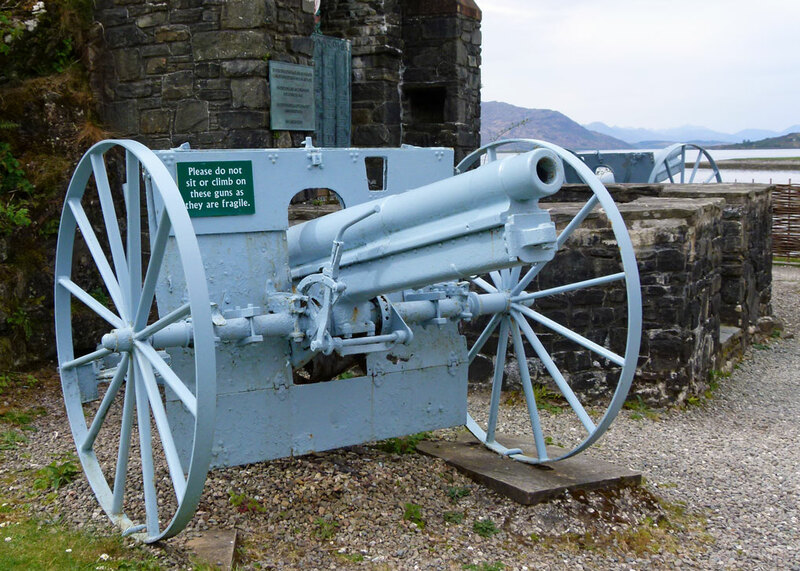 There is an alternative version of the story of Eilean Donan Castle’s destruction, that it was intentionally blown up on the orders of a Jacobite commander, Colonel Donald Murchison, to prevent it being used by Government forces. Perhaps the truth is somewhere in between. 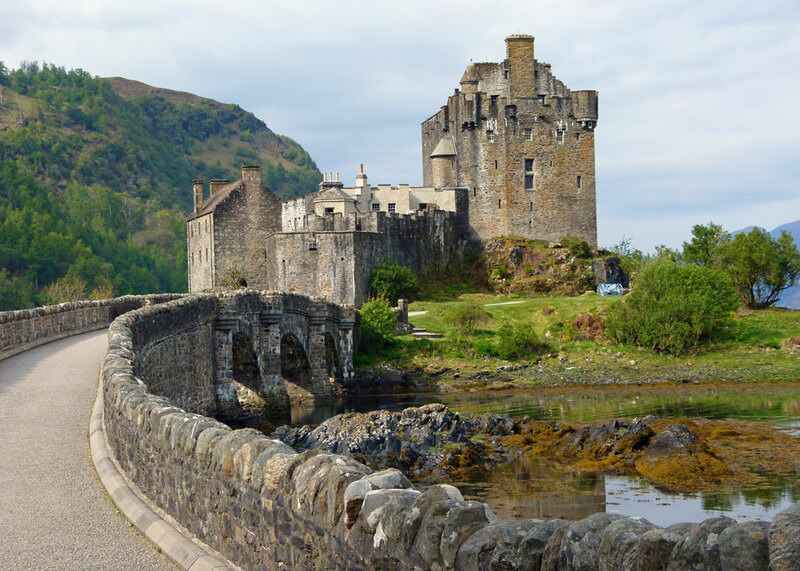 So much for the history; what about visiting Eilean Donan? Two charmingly simple iron gates displaying the MacRae and Gilstrap coats of arms guard the bridge and there’s a suitably impressive main gate, with a wicked-looking portcullis, above which an inscription in Gaelic declares the friendship between the MacRaes and the Frasers. There will never be a Fraser outside. I know, we haven’t mentioned the Frasers yet, have we? To be honest, I’m not sure where or how they come into the story. But they do; during the course of my research, I found some wonderful shots of a group of Clan Fraser pipers from Canada visiting Eilean Donan in 2011. I digress. The first thing we did, once on the island, was walk right round the castle taking in the views. There’s a Clan MacRae war memorial in the grounds, flanked by a pair of vintage German 77mm field guns (how did they get there?). 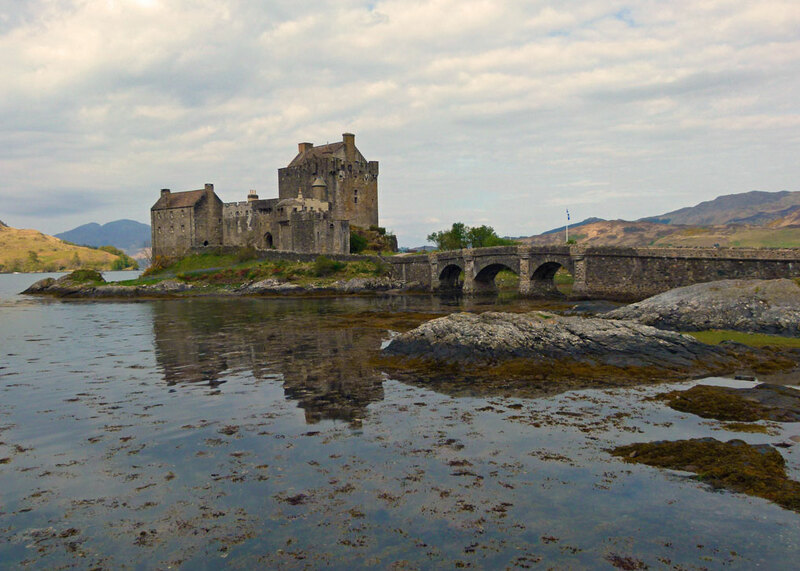 Eilean Donan has become the Scottish seat for the MacRae Clan and it was a John McCrae, a native of Guelph in Canada, that wrote the poem, In Flanders Fields. Before entering the castle, there is a fascinating introductory exhibition. 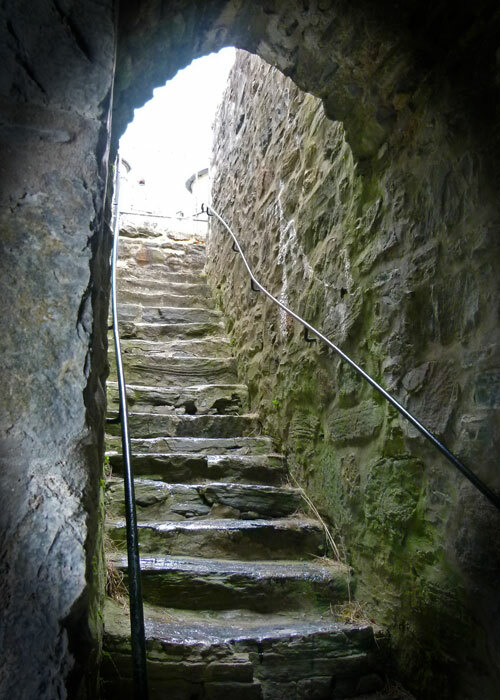 Inside the castle courtyard, where the buildings seem to grow out of the stone beneath your feet, there’s a wonderful opening near steps to the sea gate, which seems to have no other function than to provide a great view over Loch Alsh. Sadly, photography is not allowed inside the castle – I assume this is either because it is still occasionally used as a home, or because they want to sell more souvenirs – but, trust me, the highlight is the Great Hall. 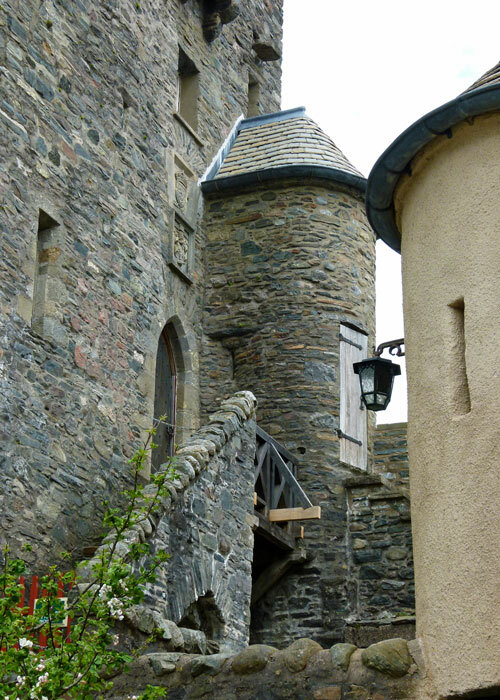 This, like much of the castle, is reminiscent of an early Hollywood interpretation of medieval Scottish and it is, therefore, quite magnificent without being awfully authentic. The stone walls are festooned with clan memorabilia and portraits, shields decorate the great flag-flanked fireplace, over which a magnificent stag’s head has been mounted, and a great table just begs you to sit down and enjoy a convivial dinner. Above your head run great timber beams from fir trees in British Columbia, a gift from Canadian MacRaes. To be fair, after the Great Hall the rest of the interior tour through bedrooms and faux battlements seemed a bit of an anti-climax to me, though there is an amusing tableau in the kitchen, where costumed mannequins prepare for a dinner party in the 1930s under the watchful eye of the lady of the house, Isabella Mary (Ella) MacRae-Gilstrap. Eilean Donan has been open to the public since 1955 and, somehow, has achieved a kind of mythical status in the minds of many. Its omnipresent image on tins of tablet*, fudge, and so on, as well as across the Internet and in pretty much every tourist guide, must ensure it is among the top visitor attractions for Scotland. Its film credits include Bonnie Prince Charlie (1948), Highlander (1986), The World Is Not Enough (1999) and Elizabeth: the Golden Age (2007). Curiously, some people seem to associate it with the TV drama Outlander, though, unless a Diana Gabaldon fan can tell me otherwise, I don’t believe Claire or Jamie have been anywhere near it; maybe it was some other time. So, is Eilean Donan Castle a fake? In some ways, it is. It is not a mighty medieval baronial bastion, more of a modern make-over. But are you still going to visit? Of course you are – you must – as long as you promise not to speculate, as I overheard one visitor do, over how “they built these things all those years ago”, or, worse, become overly-emotional about the experience. I visited EIlean Donan in 1981 and it wasn’t so touristy then. My grandmother was a MacRae and I was very excited and proud to visit. The fact that it was restored didn’t and doesn’t bother me at all. I am impressed that it wasn’t left in ruins. I went to a gathering of our clan in Cananda when I was young and liked learning about their role in the rebuild. I hope to return someday with my husband and adult children. Oh, I agree – I think it’s a wonderful place; I just get irritated when people are misled into believing it’s something it isn’t. I hope you make it back! I am very fortunate in being friends with one of the family that own the Castle. Eight of us had 2 two night stay in 2005 and it was pure magic. Will be there again in September. Lucky you! Thanks for dropping by. Very interesting post! I have to say I’ve never been that bothered about going inside anyway, but I just want to see it! (It’s one of the few “big” attractions that I’ve still never visited in Scotland, whoops!) Also is it me or does everything in Scotland have a rumoured connection with Outlander these days?? I still haven’t watched an episode. Excellent post, Mile. I haven’t visited this castle but, as we’re planning a holiday in Scotland for next year, it’s now firmly on my list of places to visit. We were planning to stay somewhere in the region of Mallaig and Morar so that fits well. The history of the place sounds amazing and I really enjoyed reading through it. Pity much of the castle is ‘fake’ but kudos to Scottish Tourism for their acute business acumen! Yes, I’ve been to Morar before and I read your post a while ago, Mike. The beach at Morar is very lovely, although, in 1964 we called it the White Sands of Morar. As you said in your post, it’s probably known as either/both. We visited ED this spring with our booksfayries and it was well worth it! 🙂 Excellent post, lovely photos and great narrative, Mike. Thank you so much for sharing! Well, we’ll do our best to hang on to you! Thanks for dropping in and leaving a comment! Even if it’s partially modernly rebuilt, the situation is so beautiful that I’m sure it’s worth a visit. No matter to me which stories might be real or fake…. I thoroughly enjoyed my time there… it is a paradise for photography…and I’m thankful so much money and time was spent to save it… as always, enjoyed your post. I remember you writing about it, Meggie, and your lovely photographs. I have googled your post – http://www.meggieontheprairie.com/2014_02_01_archive.html – and see that you were kind enough to mention the old Bit about Britain blog! Such a beautiful location and I love the castle and don’t care if it’s a fake. I saw a cheesy romantic film called Made of Honour a few years ago, the star of which was Eilean Donan castle. Hannah Gordon was in the film too! It is still old compared to our buildings. Love your photos and history story. What I remember is a map on some inside wall that showed an incredible number of villages along the shoreline of northwest Scotland, presumably before the clearances. 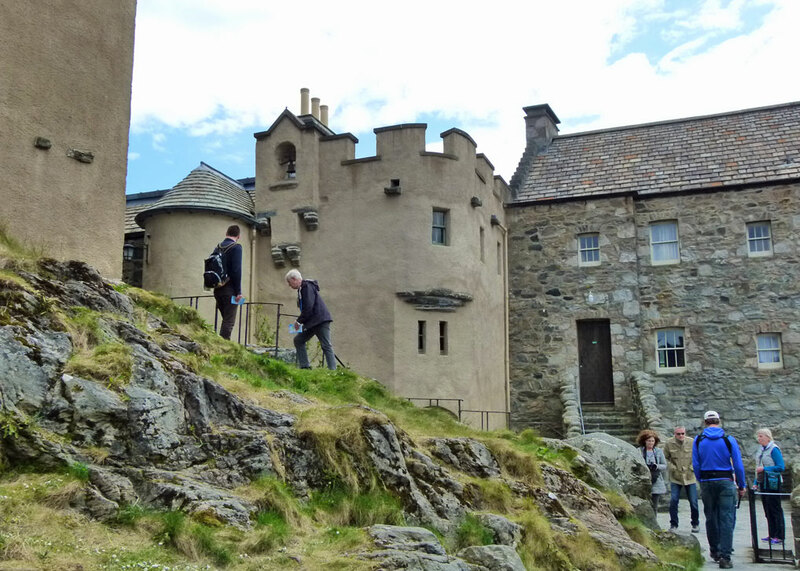 I found it fascinating, even if it was rebuilt, for all the reasons you mentioned – spectacular scenery, Jacobite history, castle architecture (so many of them are actual ruins). Anyone who visits Europe has to set aside the ‘touristy’ atmosphere in many places, and see through to what is authentic. At the very least this is an authentic and very picturesque rebuild. And it’s always nice to see Scotland featured in your posts. Yes, the demographics have changed somewhat in the Highlands – as they have pretty much everywhere in Britain, actually. Glad you like the Scottish features. More fascinating research well described. I haven’t visited, but did take some shots from a boat sometime in the ’90s. I must dig them out one day. No matter what you say, it is picture perfect. It is; I didn’t say it wasn’t. Thank you, Mike. I peeked at the website. The weddings look beautiful!! Fake or not, I love Eilean Donan Castle, set magnificently in such a glorious location. The setting is amazingly beautiful! Tablet! That akes me back. Though it is probably as well that i left Scotland when young as a diet of tablet, pan drops and Irn Brew would probably have rotted my teeth in double quick time. I have passed the castle a couple of times, but my father refused to pay to go inside. Still, it was a wonderfu lsight to see. Many is the time I have gazed at it from across the road. For some reason we never had time to make it over the bridge. Perhaps I will now, just to see how good a job they made of rebuilding it! Well so what if it’s fake. The site and surroundings have a fascinating history, and the connection to the poem Flanders Fields too. Everything over here is fake. Were there no trees that the Canadians sent some over? What a feat that would have been! Ugh. And if Tablet is remotely like Scottish oatcakes, I’ll pass on the offer. Very interesting post, Mike. great write up. Fake? Never!! It doesn’t really matter to me if it is a fake – and I wouldn’t be too interested in taking photos inside – except thatI always feel that owners are missing a trick by not allowing photos, because social media would then get far more people to come and see for themselves. From what you say, though, they probably don’t need more visitors! We didn’t get to that one and glad of it now after reading what you wrote. We were pleased with the ones we did see and that was more than enough. Oh, it’s definitely worth seeing, Marcia; it’s lovely.